This study used quantitative measures to gather data from online students to analyze the effects of perceptions about teacher verbal immediacy and classroom community on students' level of satisfaction, perceived learning, and online discussion frequency. Using convenience sampling, 214 students were recruited from undergraduate and graduate online courses. A bivariate correlation, multiple linear regression, and two-way analysis of variance (ANOVA) were used for data analysis. The Pearson coefficients demonstrated the effects of teacher verbal immediacy and sense of classroom community on satisfaction and perceived learning were positive. Multiple regression analysis revealed that sense of classroom community was the only significant factor able to explain variability of satisfaction and perceived learning. Teacher verbal immediacy was shown to be the only significant predictor of online discussion frequency. The ANOVA results indicated that students in person-oriented courses perceived higher degree of teacher verbal immediacy and sense of classroom community, regardless of their gender. Results of this study suggested that the development of sense of classroom community is critical to enhance students' satisfaction and perceived learning. In addition, the role of teacher verbal immediacy is important in online discussion. Teachers should develop communication behaviors that reduce social and psychological distance in the online learning environment. Ni, S.F. & Aust, R. (2008). Examining Teacher Verbal Immediacy and Sense of Classroom Community in Online Classes. International Journal on E-Learning, 7 (3), 477-498. Waynesville, NC USA: Association for the Advancement of Computing in Education (AACE). Retrieved April 22, 2019 from https://www.learntechlib.org/primary/p/23633/. Allen, M., Witt, P. L., & Wheeless, L. P. (2006). The role of teacher immediacy as a motivational factor in student learning: Using meta-analysis to test a causal model. Communication Education, 55(1), 21-31. Andersen, J. F. (1979). Teacher immediacy as a predictor of teaching effectiveness. In D. Himmo (Ed. ), Communication yearbook 3 (pp. 543-559). New Brunswick, NJ: Transaction Books. Anderson, T., & Garrison, D. R. (1995). Transactional issues in distance education: The impact of design in audio teleconferencing. American Journal of Distance Education, 9(2), 27-45. Arbaugh, J. B. (2001). How instructor immediacy behaviors affect student satisfaction and learning in web-based courses. Business Communication Quarterly, 64(4), 42-54. Arbaugh, J. B. (2002). 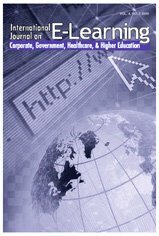 A longitudinal study of technological and pedagogical characteristics of web-based MBA courses. Academy of Management Proceedings, A1-A6. Clark, R. E. (1994). Media will never influence learning. Educational Technology Research and Development, 42(2), 21-29. Cohen, J. (1988). Statistical power analysis for the behavioral sciences (2nd ed.). Hillsdale, NJ: Lawrence Erlbaum. Ellis, K. (1995). Apprehension, self-perceived competency, and teacher immediacy in the laboratory-supported public speaking course: Trends and relationships. Communication Education, 44, 64-78. Fulford, C. P., & Zhang, S. (1993). Perceptions of interaction: The critical predictor in distance education. The American Journal of Distance Education, 7(3), 8-21. Garrison, D. R. (1990). An analysis and evaluation of audio teleconferencing to facilitate education at a distance. The American Journal of Distance Education, 4(3), 13-24. Garson, D.
Gorham, J. (1988). The relationship between verbal teacher immediacy behaviors and student learning. Communication Education, 37, 40-53. Gorham, J., & Christophel, D. M. (1990). The relationship of teachers’ use of humor in the classroom to immediacy and student learning. Communication Education, 39, 46-62. Guerrero, L. K., & Miller, T. A. (1998). Associations between nonverbal behaviors and initial impressions of instructor competence and course content in videotaped distance courses. Communication Education, 47, 30-42. Hillman, D. C., Willis, D. J., & Gunawardena, C. N. (1994). Learner-interface interaction in distance education: An extension of contemporary models and strategies for practitioners. The American Journal of Distance Education, 8(2), 30-42. Holmberg, B. (1960). On the methods of teaching by correspondence. Gleerup: Lund. Holmberg, B. (1986). Growth and structure of distance education. London: Croom Helm. Holmberg, B. (1995). Theory and practice of distance education (2nd ed.). New York: Routledge. Kearney, P., Plax, T. G., & Wendt-Wasco, N. J. (1985). Teacher immediacy for affective learning in divergent college classes. Communication Quarterly, 33, 61-74. Mehrabian, A. (1971). Silent messages. Belmont, CA: Wadsworth Publishing. Menzel, K. E., & Carrell, L. J. (1999). The impact of gender and immediacy of willingness to talk and perceived learning. Communication Education, 48, 31-40. Meyen, E. L., Aust, R.J., Bui, Y. N., Ramp, E., & Smith, S. J. (2002). The online academy formative evaluation approach to evaluating online instruction. The Internet and Higher Education, 5, 89-108. Moore, M. G. (1973). Toward a theory of independent learning and teaching. Journal of Higher Education, 44, 661-679. Moore, M. G. (1989). Three types of interaction. The American Journal of Distance Education, 3(2), 1-6. Moore, M. G., & Kearsley, G. (1996). Distance education: A system view. Belmont, CA: Wadsworth Publishing. Pogue, L., & Ahyun, K. (2006). The effect of teacher nonverbal immediacy and credibility on student motivation and affective learning. Communication Education, 55(3), 331-344. Richmond, V. P., Gorham, J. S., & McCroskey, J. C. (1987). The relationship between selected immediacy behaviors and cognitive learning. Communication Yearbook, 10, 574-590. Rovai, A. P. (2002). Sense of community, perceived cognitive learning and persistence in asynchronous learning networks. The Internet and Higher Education, 5(4), 319-332. Rovai, A. P. (2003). Strategies for grading online discussions: Effects on discussions and classroom community in Internet-based university courses. Journal of Computing in Higher Education, 15(1), 89-107. Rovai, A. P., & Lucking, R. (2000, September). Measuring sense of classroom community. Paper presented to Learning 2000: Reassessing the Virtual University, Roanoke, VA.
Sanders, J. A., & Wiseman, R. L. (1990). The effects of verbal and nonverbal teacher immediacy on perceived cognitive, affective and behavioral learning in the multicultural classroom. Communication Education, 39, 341-353. Sutton, L. (2001). The principles of vicarious interaction in computer-mediated communications. Journal of Interactive Educational Communications, 7(3), 223-242. Windschitl, M.
Sense of Community, Perceived Learning, and Self-Regulation: Do they matter to online students?